Carmen Rita Wong speaks to the audience gathered at Café Boulud in Palm Beach’s Brazilian Court Hotel on Friday, March 2. 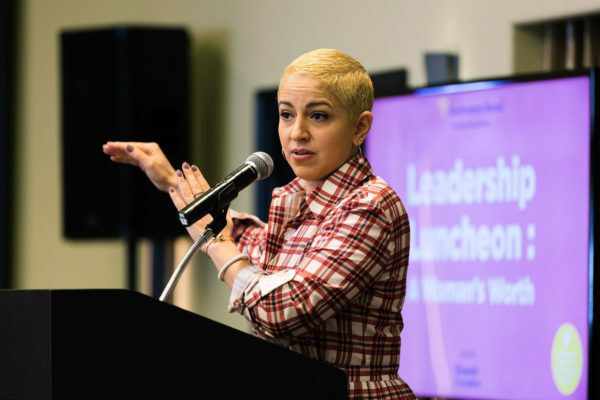 Wong was the featured speaker at Hispanic Executive magazine and Northwestern Mutual’s Leadership Luncheon: A Woman’s Worth. Northwestern Mutual’s Peter Striano of the Striano Financial Group and Hispanic Executive CEO Pedro Guerrero opened the event. Guests gathered for lunch at Café Boulud in Palm Beach’s Brazilian Court Hotel for Hispanic Executive’s first event of the season. Wong spoke on her inspiring personal and professional journey as an American Latina of black and Asian descent, offering words of wisdom and secrets to navigating the world as it is. “As a woman of color in the white male world of media and finance, it wasn’t easy. There were challenges, but there were also advantages,” Wong said. She offered two pieces of advice for the next generation of women. The first is to have grit and focus. They need to focus and do the work to get ahead; the roadblocks are not all encompassing. The second is that they should go outside of their community to see how other people live. “My success has been up and down. I was an editor, then got laid off. I had a show, it got cancelled. The people that have stuck with me through it all I will never forget.” – @CarmenSense giving advice to approach your career with an open heart and stick with the good people. Another piece of wisdom Wong shared with the audience was how to reinvent yourself from one role to another and one industry to another. She draws on her creativity to find solutions, and she takes advantage of blockades. “When things crash, I already am looking at what’s the next thing I can get into,” she said. Then, always know how the business you’re in works and be good at what you do because it’s your reputation that helps you handle transitions. If two of those three things are accomplished, she said, you’ll be surprised at your value. To see more photos from this event, please visit our Facebook page.